As a Director of Career Services, these individuals manage the overall career service operations of an organization or educational institution. 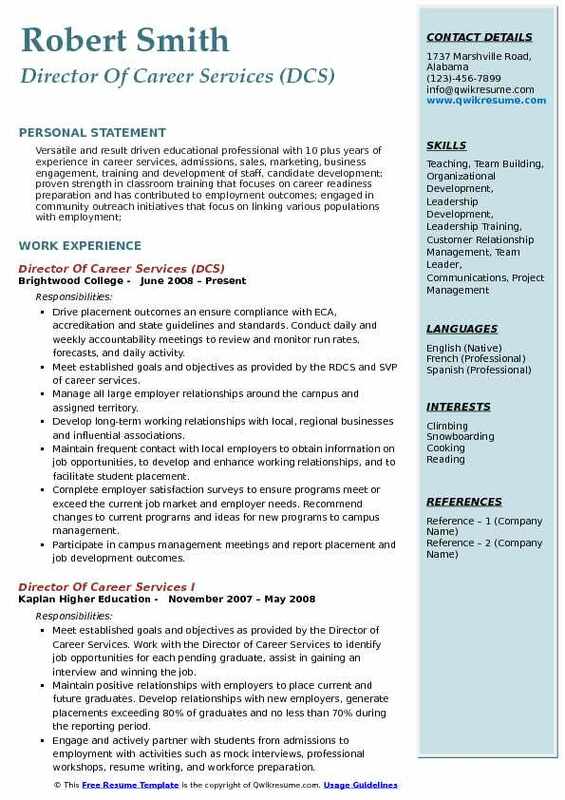 The roles and responsibilities listed in the Director of Career Services resume include some or all of the following – managing and overseeing career service center operations which may include student success, graduate outcomes, career identification, career search and employment pursuits; liaising between employers, other departments, students and universities; hiring federal work-study students, developing new contacts and providing career advice expertise. Minimum qualifications expected for this post are a thorough understanding of centralized career service concept, professional networking or contacts mainly with employment and university sectors, demonstrable marketing or public relation abilities and effective organizational skills. While a College degree in the field of Human resource or related is considered mandatory, employers highly prefer a Master’s degree with relevant experience in career service or placement process. Summary : Detail-oriented Director of Career Services with strong written and oral communication skills. Well versed in a variety of educational settings with a diverse skill set which includes: management, budget responsibility, training and staff development, business development, internship/externship development, resume writing, mock interviewing, student professional development training, career fair planning other business and education programs. Ensure that all activity is clearly documented in the graduate's file and in the company's electronic reporting system. Keep abreast of current employment trends, establish and maintain essential business community relationships to ensure the timely placement of graduates in their field of study. Maintain an active lead generation system to ensure sufficient job opportunities are available for students and graduates. Achieve and exceed placement results in each program consistent with company guidelines, department of education and ACCSC standards. 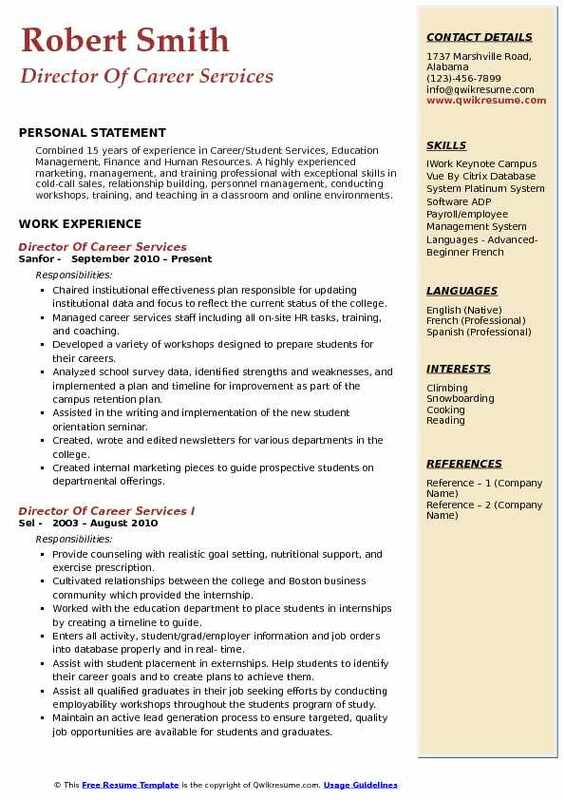 Critique student and graduate resumes, cover letters, and other employment-related documentation. Help students to identify their career goals and to create plans to achieve them. Conduct employability workshops throughout the students' program of study. Maintain relationships with all graduates until employment is successfully secured within the field or related field of study. Ensure that all department of education, ACCSC and education affiliates regulations are followed and maintained. Effectively screened exit-process and placement activities for students exceeding goals by 20%. Summary : Driven management professional possessing human resource and administrative acumen, with a strong professional ethics. Experienced in career development, academic operations, planning and organizing the educational process, while offering the proven ability to achieve maximum productivity with diverse work groups. Responsible for the management of the overall Information Systems Operation for over 444 students and over 50 staff members. Maintain budgetary constraints for IT, student management and students services departments which reduces the cost for additional staff members and oversight of those departments. Member of the senior management staff which assist in the daily operations of the school's functionality, to ensure it is maintained in an efficient and productive manner. Our month-to-date attrition rate is currently 3.8 %. Assigned interim President when the President is away on seminars, conferences, and illness as needed. Managed retention of the student population by providing a secure school environment, and developed a fare card program which enabled 64 students to continue their education. Collaborate between departments to ensure retention of the student starting with the enrollment process and maintaining contact with students until graduation. Assisted in the re-enter and leave of absence process for the retention of the student. Managed and supervised eighteen (18) students for the federal work study program. Coordinated meetings between financial aid and admissions departments to ensure meetings ran smoothly and proof of graduation certificates was requested for students in a timely manner. 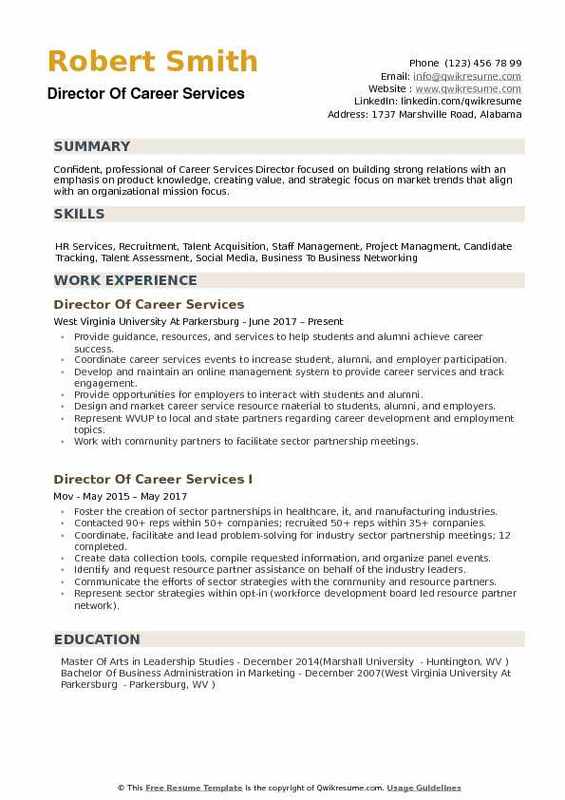 Objective : A results-driven Career Services Director who thrives on planning, developing and administering career planning, resume writing, business development and all aspects of management for individuals and businesses seeking success. A dynamic leader with the proven ability to effectively manage and develop processes to ensure attainment of set goals. A dedicated and dependable manager that strives to uphold professional standards and company policies. Establish goals and objectives and develop strategic and operational plans for providing career services; assess and report outcomes to management and key stakeholders. Supervise staff with consistent opportunities for professional growth and development; hire, train. Manage department budget for staffing, programming, and various events. Ensure that student follow-ups are being conducted in accordance with department policies. Actively maintain an awareness of employment and industry trends and discuss research with. Plan, promote and market services and information to students, including information resources. Develop and implement strategic plans according to Sci’s mission, goals, and market realities. Track all student/graduate cohorts in student administrative system software and ensure proper documentation of student files to maintain compliance with state, federal and accreditation. Objective : Goal-oriented, decisive manager skilled in building positive rapport and mutual respect with colleagues and customers. Able to manage multiple projects simultaneously, adapting to changing deadlines and priorities in a timely, professional manner. Solid track record of success and demonstrated expertise in the multiple areas like Quality Assurance Relationship Building, Strategic Planning, Staff Development/Training Sales/Marketing, Career Coaching etc. Manage the daily operations of the career services department to achieve maximum placement. Achieve placement results in each program that are consistent with company guidelines and applicable regulatory agency standards. Supervise, monitor, evaluate and motivate staff to achieve all career services unit goals including employment rate, customer satisfaction, employer presence. Plan and coordinate career fairs and other career services focused events. Participate in campus orientation, open houses, and graduation events. Maintain a high level of integrity and accuracy of all graduate employment records. Involved in the reporting of graduate employment statistics as required by the accrediting agency and/or department of education. Ensure accurate use of student database system on a daily/ weekly basis. Assist director of education in the coordination of advisory boards for all programs. Drive placement outcomes an ensure compliance with ECA, accreditation and state guidelines and standards. Conduct daily and weekly accountability meetings to review and monitor run rates, forecasts, and daily activity. Meet established goals and objectives as provided by the RDCS and SVP of career services. Manage all large employer relationships around the campus and assigned territory. Develop long-term working relationships with local, regional businesses and influential associations. Maintain frequent contact with local employers to obtain information on job opportunities, to develop and enhance working relationships, and to facilitate student placement. Complete employer satisfaction surveys to ensure programs meet or exceed the current job market and employer needs. Recommend changes to current programs and ideas for new programs to campus management. Participate in campus management meetings and report placement and job development outcomes. Implemented a comprehensive interview preparation program that dramatically increased the percentage of post-interview offers 18% to over 50%. 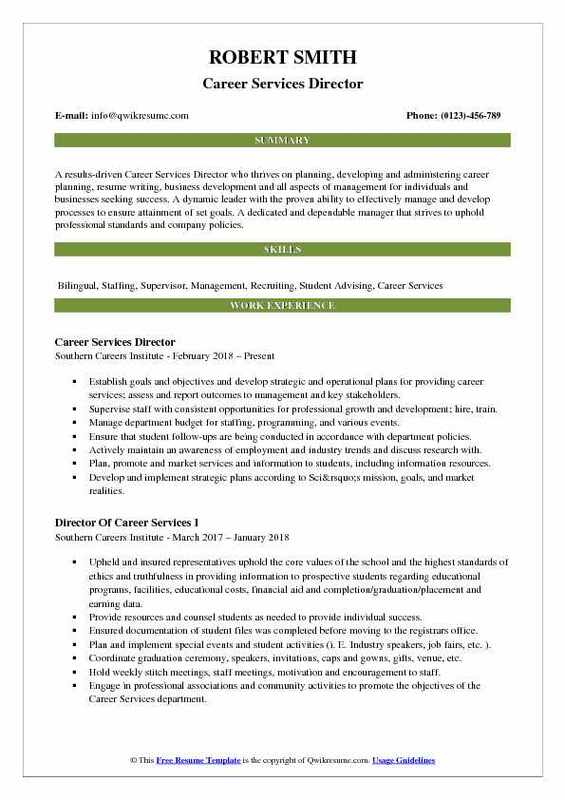 Summary : Over 18 years of experience in Director of Admissions and Career Services roles. Demonstrated success in analyzing and resolving problems, and passing ACCET/ACCSC visits and audits. A results-oriented team-player with the natural creative ability and exceptional communication skills. 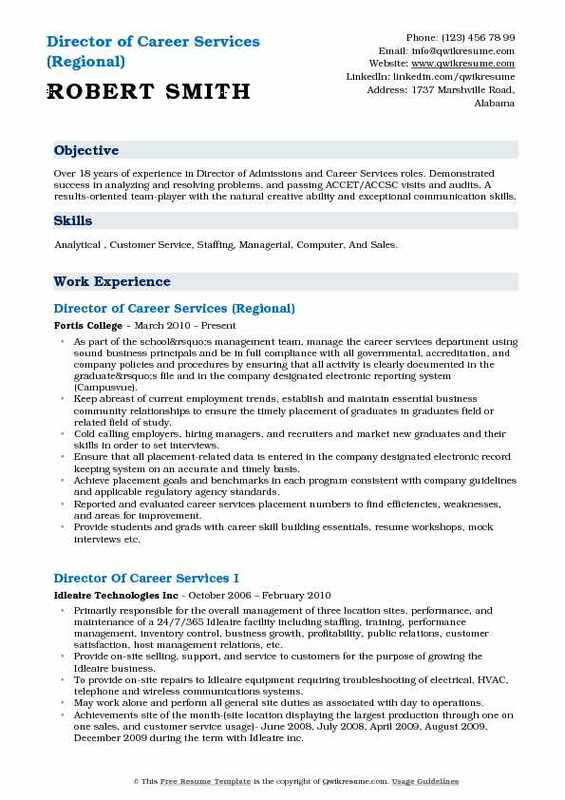 Skills : Analytical , Customer Service, Staffing, Managerial, Computer, And Sales. 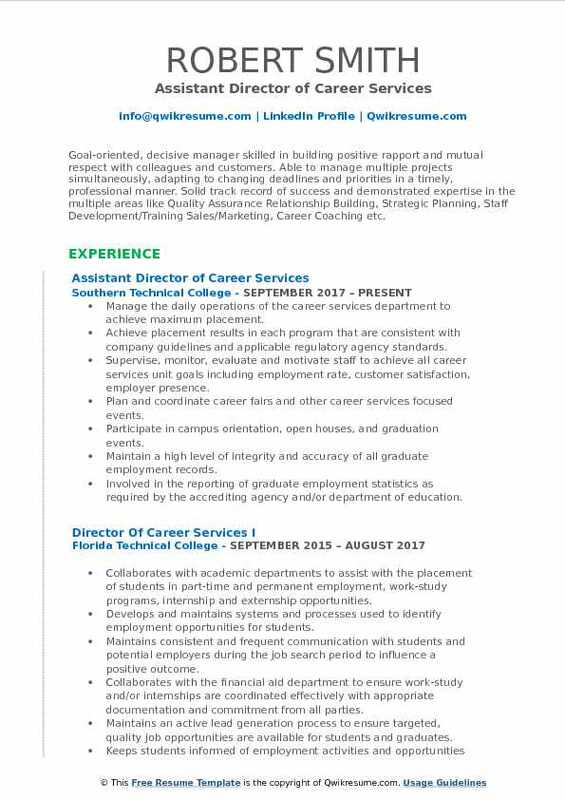 As part of the school’s management team, manage the career services department using sound business principals and be in full compliance with all governmental, accreditation, and company policies and procedures by ensuring that all activity is clearly documented in the graduate’s file and in the company designated electronic reporting system (Campusvue). Keep abreast of current employment trends, establish and maintain essential business community relationships to ensure the timely placement of graduates in graduates field or related field of study. Cold calling employers, hiring managers, and recruiters and market new graduates and their skills in order to set interviews. Ensure that all placement-related data is entered in the company designated electronic record keeping system on an accurate and timely basis. Achieve placement goals and benchmarks in each program consistent with company guidelines and applicable regulatory agency standards. Reported and evaluated career services placement numbers to find efficiencies, weaknesses, and areas for improvement. 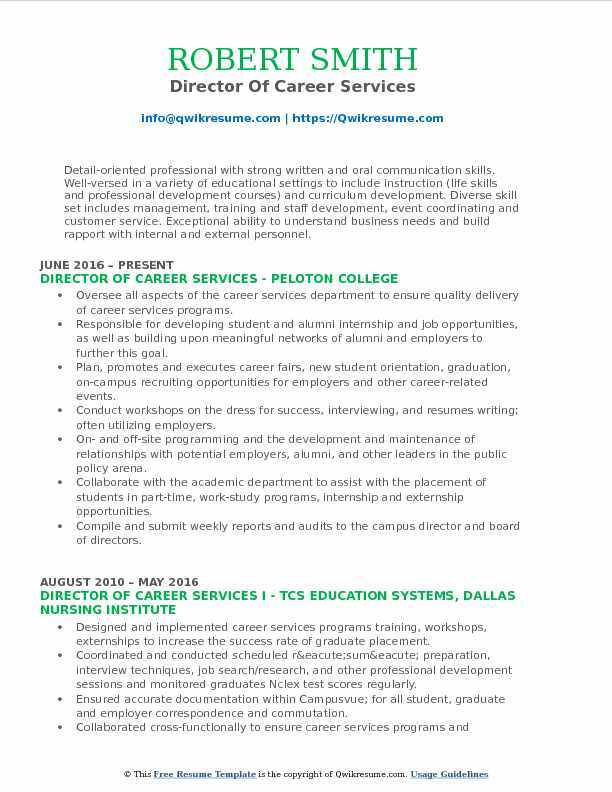 Provide students and grads with career skill building essentials, resume workshops, mock interviews etc. Summary : Detail-oriented professional with strong written and oral communication skills. Well-versed in a variety of educational settings to include instruction (life skills and professional development courses) and curriculum development. Diverse skill set includes management, training and staff development, event coordinating and customer service. Exceptional ability to understand business needs and build rapport with internal and external personnel. 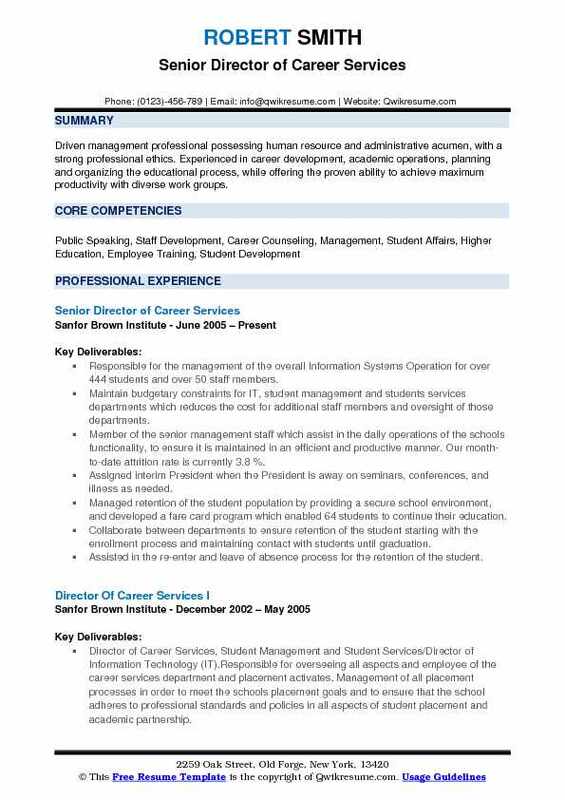 Oversee all aspects of the career services department to ensure quality delivery of career services programs. Responsible for developing student and alumni internship and job opportunities, as well as building upon meaningful networks of alumni and employers to further this goal. Plan, promotes and executes career fairs, new student orientation, graduation, on‐campus recruiting opportunities for employers and other career‐related events. Conduct workshops on the dress for success, interviewing, and resumes writing; often utilizing employers. On- and off-site programming and the development and maintenance of relationships with potential employers, alumni, and other leaders in the public policy arena. Collaborate with the academic department to assist with the placement of students in part‐time, work‐study programs, internship and externship opportunities. Compile and submit weekly reports and audits to the campus director and board of directors. Develop and maintain the campus database system to identify employment opportunities for students. Maintain consistent and frequent communication with students and potential employers during the job search period to influence a positive outcome. 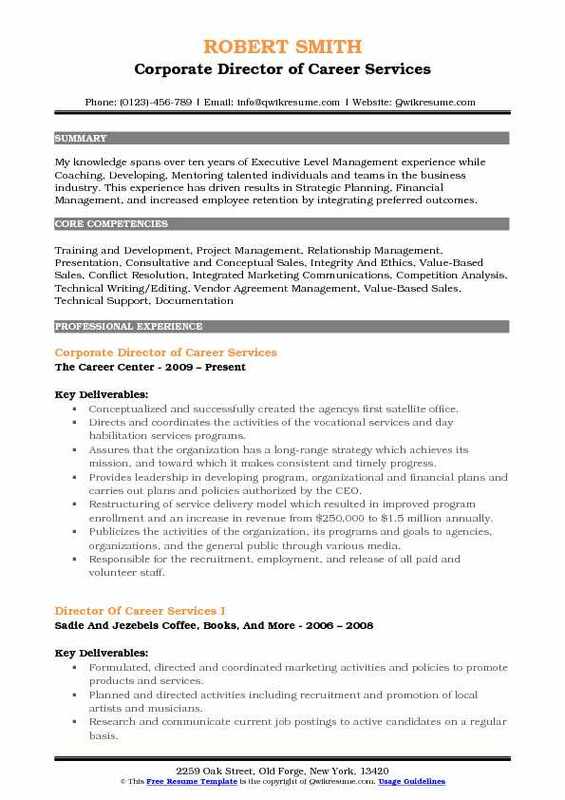 Summary : My knowledge spans over ten years of Executive Level Management experience while Coaching, Developing, Mentoring talented individuals and teams in the business industry. This experience has driven results in Strategic Planning, Financial Management, and increased employee retention by integrating preferred outcomes. Conceptualized and successfully created the agency's first satellite office. Directs and coordinates the activities of the vocational services and day habilitation services programs. Assures that the organization has a long-range strategy which achieves its mission, and toward which it makes consistent and timely progress. Provides leadership in developing program, organizational and financial plans and carries out plans and policies authorized by the CEO. Restructuring of service delivery model which resulted in improved program enrollment and an increase in revenue from $250,000 to $1.5 million annually. Publicizes the activities of the organization, its programs and goals to agencies, organizations, and the general public through various media. Responsible for the recruitment, employment, and release of all paid and volunteer staff. Maintains a climate which attracts, retains, and motivates a diverse staff of top quality professionals. Responsible for reviewing the program operations and ensuring compliance through implementation of the agency's QA program including outcome measurement system as well as an implementation of program standards meeting CARF, DDA, DORs and MHA guidelines. 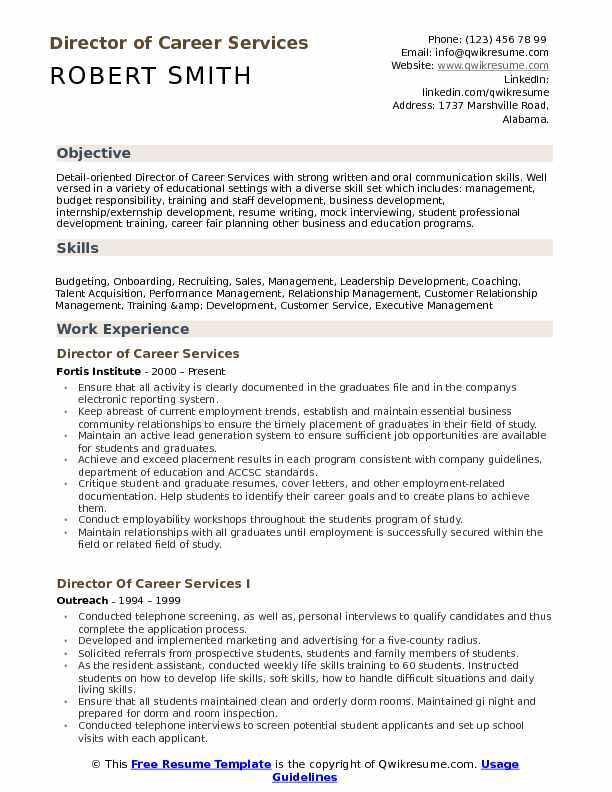 Summary : Combined 15 years of experience in Career/Student Services, Education Management, Finance and Human Resources. A highly experienced marketing, management, and training professional with exceptional skills in cold-call sales, relationship building, personnel management, conducting workshops, training, and teaching in a classroom and online environments. Chaired institutional effectiveness plan responsible for updating institutional data and focus to reflect the current status of the college. Managed career services staff including all on-site HR tasks, training, and coaching. Developed a variety of workshops designed to prepare students for their careers. Analyzed school survey data, identified strengths and weaknesses, and implemented a plan and timeline for improvement as part of the campus retention plan. Assisted in the writing and implementation of the new student orientation seminar. Created, wrote and edited newsletters for various departments in the college. Created internal marketing pieces to guide prospective students on departmental offerings. Developed a career services newsletter to drive topics that will increase the success rate of first time interview to offer ratios. Objective : Confident, professional of Career Services Director focused on building strong relations with an emphasis on product knowledge, creating value, and strategic focus on market trends that align with an organizational mission focus. Provide guidance, resources, and services to help students and alumni achieve career success. Coordinate career services events to increase student, alumni, and employer participation. Develop and maintain an online management system to provide career services and track engagement. Provide opportunities for employers to interact with students and alumni. Design and market career service resource material to students, alumni, and employers. Represent WVUP to local and state partners regarding career development and employment topics. Work with community partners to facilitate sector partnership meetings. Identify and communicate opportunities to strengthen the WVUP and regional industry sectors. Recruit sector partners and stakeholders; garner employer engagement; coordinate participation.